After leading Kolkata Knight Riders to its maiden IPL title win, skipper Gautam Gambhir said the victory sends out a message that cricket is a team game and it is not confined to individual performances. Manvinder Bisla, who is in the limelight for his exploits in the IPL final, has come a long way since representing India as a bowler in the Under-19 World Cup in 2002. Gambhir’s superstition with pads works! It is common knowledge that sportsmen tend to relate success with superstition and it has been affirmed by Gautam Gambhir who has been so superstitious through the IPL that he stuck to his routine of keeping his pads on till the very end in every game. There is a sudden void in the sporting scene. There has to be. After 51 days of action-packed cricket, the Indian Premier League's fifth edition came to a close with Kolkata Knight Riders being crowned champions. The Chennai Super Kings' victory wagon was finally stalled, and it took some whirlwind performances to do so. "Sansarpur to London Olympics", a book tracing the history of Indian hockey for the past 60 years, written by Olympian Col Balbir Singh, was launched here today by Chief of the Army Staff Gen VK Singh. Five-time champions India defeated hosts Malaysia 3-2 to put their campaign back on track in the Sultan Azlan Shah Cup hockey tournament here today. England were on the brink of winning the second Test against the West Indies with more than a day to spare at Trent Bridge here today. Roger Federer's bid for a record 17th major tennis title began with another landmark today, when he won his 233rd match at a Grand Slam event, equalling the achievement of Jimmy Connors. Defending champion Viswanathan Anand was today stretched to the tie-breaker of the World Chess Championship by his Israeli challenger Boris Gelfand following a draw in the 12th and final game here. After leading Kolkata Knight Riders to its maiden IPL title win, skipper Gautam Gambhir said the victory sends out a message that cricket is a team game and it is not confined to individual performances. Gambhir's strong reaction came when he was asked if team hoped of win when he himself was out early while chasing 191. He was also asked about spinner Sunil Narine's contribution in his side's impressive show this season. But the skipper asserted that his side was out to prove a point that it's the team that wins and deserves credit and not any individual. Gambhir could score just two and it was Manvinder Bisla's terrific 89-run knock and his 136-stand with Jacques Kallis (69) for the second wicket, which set up the win. "It's not about me or that I got out early. It is about 11 people who took the field. The way Bisla batted, the maturity and experience that Jacques showed and the cameos from Shakib and Tiwary at the end. It's not about how you start, it's how you finish. Those performances won the game for us," Gambhir said. Gambhir got a bit irritated when he was asked about West Indian spinner Narine's contribution in team's success. "Since the first press conference I did, I've said I hate to talk about individuals. It was not about Sunil Narine. KKR has never been about one individual, whether that's me or someone else. There has been a lot of talk about my form. I got a hundred in Bangladesh, I had a decent ODI series, but it was not about that. "We all wanted to prove to the nation that cricket is a team sport and credit should go to the team. If you want individual credit you should play tennis, badminton or some individual sport, not a team sport such as cricket. "From the first day I put this to the team: there will be no single day when the credit goes to an individual. Victory always belongs to the team. It was important to prove to the country that cricket is a team game, and hopefully we've gone some way in doing that," he said. When Gambhir was addressing the media, he was not smiling despite a memorable win. Asked about this, he said, "Maybe it has to sink in. Maybe when that happens I'll get a smile on my face. As I said, that's how I've been. It works for me. Being intense does not mean that you're always serious. Sometimes you just want to be in your shell and not show out too many emotions to the world." When quizzed, how team co-owner Shah Rukh Khan reacted to the win, Gambhir said he has been a good support and deserved this happiness, specially after a few controversies around him. Manvinder Bisla, who is in the limelight for his exploits in the IPL final, has come a long way since representing India as a bowler in the Under-19 World Cup in 2002. Bisla started as a bowler but destiny had other plans for him as he later transformed into a wicketkeeper-batsman for Haryana, where he played his entire junior cricket, before shifting base to Himachal Pradesh. The little-known cricketer, who has been hopping teams in the IPL, smashed a 48-ball 89 to help Kolkata Knight Riders lift its maiden IPL title. "He has done very well. We are happy for him. Bisla has created an opportunity for himself and we wish and hope he goes from strength to strength," Haryana Cricket Association's secretary Anirudh Chaudhry told PTI. Bisla, who made just three runs in his last first class match in December 2010 while playing for Himachal versus Baroda, was dropped last season. In the IPL, he joined KKR last year but did not get much opportunity. Before signing up with the Kolkata outfit, he also played for the Deccan Chargers and Kings XI Punjab. "Now I can be honest and tell you that it was a superstition," the Kolkata Knight Riders captain side after his side's triumph in the fifth edition of Indian Premier League here last night. The only occasion he removed his pads after getting out, the Knight Riders lost. "There was only once in the tournament when I took off my pads after I got out, and that was against the Kings XI. We could not manage to get 13 from 12 balls in that end. "I was not shell shocked because it wasn't about me getting out - KKR is not about me, it's about we. I was just one of the players going out there to contribute for KKR. I had faith in all the players." Despite chasing an imposing target, Gambhir said he was confident that his side would cross the line. "I would be lying if I said I was absolutely relaxed. When you're playing such a big game there is a bit of tension involved. But somewhere down the line I knew that we could cross the line. "The important thing was to stay in touch with required rate and take it to the 18th over with wickets in hand. In a big game, if you need 20 from the last two with six wickets in hand and have guys like Shakib and Manoj at the crease the batting side is going to come good more often than not. But the IPL was not only about the final. It was about every single game played, every run, every wicket. It was also about some unsung heroes who have been overshadowed as their teams failed to last the distance. But their contributions to this edition have given it the hue that has never been seen before. So let's hit the rewind button and relive what has been an incredible festival of the gentleman's game. Chris Gayle takes the honours, and by some distance. The West Indian, who is probably cricket's first and most ferocious mercenary, redefined the word 'Power'. Not only that, he also changed his batting style and planned his innings. Madness can be dangerous. And madness with a plan is lethal. At 733 runs, he was way ahead of the competition. There were many Indian players who put in mesmerizing performances this season. Sehwag finally got going, Gambhir, as captain and batsman was in his element and there were also the likes of Shikhar Dhawan and Rohit Sharma, who came of age. But one man, after a long time, got the Indian fan excited every time he went in to bat. Ajinkya Rahane, the Rajasthan Royals opener. Rahane's technical abilities and brutal flair were a heady cocktail that had the crowds swinging all through. Once again, this was a section that was crowded with performers, but the stand out player was Kings XI Punjab's Mandeep Singh. Not only did Mandeep show great technique and improvisation, he also was electric in the field. He has a long way to go in terms of learning the art of converting starts into big scores, but the promise he has shown, won him admirers everywhere. The Rising Star award was enough justification. Murali Vijay had a quite IPL season, but when the team required a big one, he gave them one of the biggest. His innings of a 113 against Delhi Daredevils not only put his team in the final, it also checked the wagging tongues that CSK had been lucky to get into the play-offs. That innings might have come a match early for the Chennai outfit, but it went a long way in cementing the fact that CSK are still the most consistent and dangerous side in the League. The 39th match of the IPL, played between Delhi and Rajasthan, played at the Kotla, went in Delhi's favour by a single run. It was a match that epitomized the nature of the tournament and how closely tied the teams were. This also was the match that saw Delhi take firm control over proceedings in the points table, and started a slide for the Royals that they ultimately failed to stem, despite starting the League very strongly. Sunil Narine has become a household name in India, and all over the world where cricket is followed. The new mystery man had a phenomenal debut season, picking up 24 wickets, next only to Morne Morkel. Also his economy rate of 5.47 is the highest for anyone who played more than 10 matches. 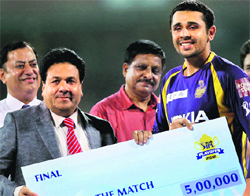 He was instrumental in KKR's consistent run and balance in their bowling attack that helped them to their maiden title. Ideally the skipper of the winning team has to be the man for this award, but in this year's IPL, we had a split verdict. Both finalists, Gambhir and Dhoni share the honours on this one. Gambhir for his fiery attitude and exemplary leading style, and Dhoni for ensuring that his team could hold their head high despite being beaten. Gambhir's tactics got his KKR side the trophy, and Dhoni's ice-cool temperament, brought his side back from the dead, and almost within kissing distance of a hat-trick of titles. "Sansarpur to London Olympics", a book tracing the history of Indian hockey for the past 60 years, written by Olympian Col Balbir Singh, was launched here today by Chief of the Army Staff Gen VK Singh. The book traces the gold era of Indian hockey, its rise and fall and providing many interesting vignettes, which includes the author's long association with General Singh. The launch was attended by a galaxy of sportspersons and other dignitaries. When Balbir Singh first met VK Singh, he was not a general. They both were gentleman cadets at the Indian Military Academy (IMA), Dehra Dun, and the one common thread that bound them together, was their passion for hockey. While the General concentrated more on his soldiering skills to scale greater heights in the Army with hockey remaining as a passion still, Balbir Singh went on to play the highest level of hockey, to represent the country, and to feature in Indian squad that won first-ever Asian Games gold at Bangkok in 1966, and then an Olympic bronze at Mexico in 1968. Though Balbir Singh too made a mark as a soldier, retiring as a Colonel, he was, nevertheless, fully committed to the game of hockey, and after his playing days were cut short due to a knee injury, he kept his active association with the game as a coach and then as a selector. (Presently, he is the senior most selector of the men's team). Balbir Singh was perhaps the only sportsman to receive the Arjuna Award in his IMA uniform, and he was also the only gentleman cadet to receive the coveted sports award. General Singh was so proud of his fellow cadet's achievement that after the award ceremony, whenever a film was screened in the cantonment area of Dehra Dun, Balbir Singh receiving the Arjuna Award from President VV Giri was shown before the screening of the Films Division news reel. No surprise, when Balbir Singh penned his memoirs, he was determined to ensure that the launch was done by none other than the General. 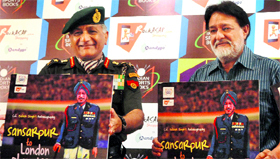 Though the paper back edition will take some more time to come out, General Singh launched the E-book of Col Balbir Singh's "Sansarpur to London Olympics" today, three days before his retirement as the Chief of the Army Staff. This will be the first Indian sports book on e-book platform, to help it reach out to a vast readership. The book dwells on the glorious past of the Indian hockey, the present uncertainty, and the future course of action, in a bid to capture the lost glory. There are many interesting vignettes on hockey and Balbir Singh seems to have given a frank account of his life-long affair with the game, which he has had the privilege of playing and observing from the ring side for the past 60 years. He gives a touching account of Sansarpur, the matrix of Indian hockey, in the halcyon days of the game. As a player, Balbir Singh was perhaps the only half back, who used to score goals from the half line, covering the goalkeeper at the same time. Col Balbir Singh comes up with constructive criticism by clearly outlining a strategy to revive Indian hockey, and to regain our Olympic glory. He feels that the only sure shot way to uplift Indian hockey would be to induct quality foreign coaches like Rick Charlesworth (Australia), Paul Lisek (Germany) or Roelant Oltman (Holland), because these coaches know how to manage the defence, India's weak link. Balbir says the advantage of having a coach like Paul Lisek is that Germany play controlled hockey, unlike the fast variety played by countries like Australia and New Zealand, and the blue turfs for the London Olympics, slippery and bouncy, will suit the Indian team like a T "as they play a slow game". Germany erect a solid defence, which lets in very few goals while Australia play speedy hockey, which often puts their own defence in peril and "our own defence is very slow". Col Balbir Singh feels that a good team should adapt to any surface, and if the blue turf in England is slippery and bouncy, that's what India had experienced while having coaching camps at the SAI Centre in Bangalore for almost a year before it was shifted to Pune. Balbir was of the opinion that the Indian team who won the first Asian Games gold for India in 1966 at Bangkok, beating Pakistan 1-0 in the final, on December 19, was one of the best-ever. In fact, December 19 has a lot of significance in Balbir's life, as many turning points happened on this date! And the golden goal against Pakistan at Bangkok was fashioned by three Balbir Singhs-Col Balbir Singh set up the first pass, which was relayed back to him by Balbir Singh of Punjab Police, before he essayed it towards Balbir Singh of Railways to make the final kill. Bouncing back from yesterday's loss to Great Britain, India played a brisk game in a fast-paced encounter and led from the start, but had to ward off Malaysia's determined fightback. But the highlight of the day was title favourites Great Britain's 2-3 shocking defeat at the hands of Argentina which completely opened up the tournament. New Zealand still leads the standings with nine points from three successive wins, while both Argentina and India lie second with six points from four matches each. Against Malaysia today, India's defence faced some anxious moments early on as goalkeeper Bharat Chetri first came out to block a shot from Tengku Ahmad in the second minute and then blocked a penalty corner shot by Shahrun Nabil in the sixth minute. Two minutes later, young Malaysian striker Faisal Saari missed a sitter by flicking wide of an open goal after his initial push rebounded off the Indian custodian's pads. After the initial burst, Malaysia were at the receiving end as India produced two goals in the space of two minutes to take charge of the game. Danish Mujtaba deflected in Sarvanjit Singh's shot into the boards in the 10th minute and then Shivendra Singh sent a scorching grounder into the boards from top of the circle in the next minute. Shivendra's quick reflexes helped keep up the pressure after he had failed to stop the penalty corner push, but dribbled the ball back into the scoring area to take the shot. India also wasted a number of scoring chances as S K Uthappa shot straight into goalkeeper Subramiam Kumar in the 16th minute and then Yuvraj Walmiki shot wide after the ball was switched around in a brisk counter-attack in the 26th minute. Malaysia came close to reducing the lead in the 30th minute, but India captain Chetri brought off fine saves, first charging out to block Tengku's solo attempt. The shot rounded off Chetri's pads to Faisal Saari, who then unleashed a firm drive, only to see the goalkeeper block the shot again. Malaysia pulled a goal back four minutes after half-time when Muhammad Amin converted their second penalty corner, but India scored at the other end within a minute to make it 3-1 as Tushar Khandekar capitalised on a rebound from the goalkeeper, who had blocked Shivendra's shot from the right. Malaysia displayed a spirited game and were rewarded with a fine goal by Muhammad Fitri Saari, who dribbled into the circle and unleashed a diagonal shot, which goalkeeper Chetri tried to stop, but only managed to deflect it into the net. Looking for equaliser, the Malaysians forced three penalty corners in the space of six minutes, but the Indian defenders held their ground. This was Malaysia's first loss in three outings, having drawn their previous two matches. Among other teams, South Korea's 4-0 win over Pakistan earlier in the day boosted their points tally to four from as many matches. in the second match of the day, Mathias Paredes scored two goals as Argentina pulled off an upset 3-2 victory over fancied Great Britain. Set 108 for victory, England were 74 without loss at tea on the fourth day, needing just 34 more runs for a victory that would give them an unbeatable 2-0 lead in this three-match series. England captain Andrew Strauss, who made 141 in the first innings to follow his hundred in his side's five-wicket first Test win at Lord's, was 40 not out and fellow left-hander Alastair Cook 33 not out. Earlier, Marlon Samuels resisted England's attack with a dashing 76 not out, top-scoring for the tourists for the second time in the match after his first innings 117. However, there was a sense in which he was merely delaying what would, barring a dramatic collapse, be West Indies' seventh straight Test loss on English soil. Shortly after lunch, West Indies were all out for 165 in their second innings. Federer beat German Tobias Kamke 6-2, 7-5, 6-3 in the first round of the French Open and can surpass American Connors's professional-era record by continuing his progress here. Women's world number one Victoria Azarenka was lucky to advance after being five points away from defeat against Italian Alberta Brianti in their first-round match, but turned the tables to scrape through 6-7, 6-4, 6-2. Federer, the 2009 champion at Roland Garros and runner-up four times to Rafa Nadal, hit some wayward shots against the 78th-ranked Kamke but was happy to get through in straight sets. "They are never easy, those first rounds," the Swiss world number three told a news conference. "I missed a few too many shots but I was in the lead so I could afford to do those." Asked about matching Connors's record, Federer said he had not been aware of it before the match. "But I'm very happy, because Jimmy Connors was a huge champion, still is, so it's a great pleasure," he added. "That (record) is a big one, because (it means) longevity. I have been so successful for such a long time and to already tie that record, (at) 30 years old is pretty incredible, so I'm very happy." 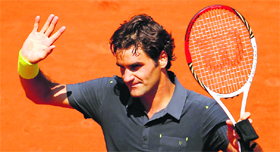 Federer will now meet Romania's Adrian Ungur who beat Argentine David Nalbandian 6-3, 5-7, 6-4, 7-5. Australian Open champion Azarenka, who would have been the first top-seeded woman to lose in the opening round, hit 60 unforced errors in her two hours 16 minutes on Philippe Chatrier court. "I think that says it all," the Belarussian said. "Bad days happen." She was happy, though, that a shoulder injury which forced her to pull out of the Italian Open nearly two weeks ago had healed. "It's much better, the pain went away," she said. "But I didn't have much time to prepare." Defending champion Li Na raced through her opening match, thrashing Romanian Sorana Cirstea 6-2, 6-1 in 58 minutes. Li, who became the first player from an Asian nation to win a Grand Slam singles title here last year, said she was still smarting from her narrow defeat by Maria Sharapova in the Italian Open final eight days ago. Battling to be in top-10 before the June 11 cut-off mark for the London Olympics, Mahesh Bhupathi and Rohan Bopanna were today drawn against French team of Marc Gicquel and Edouard Roger-Vasselin in their men's doubles opening round of the French Open, here. Bopanna and Bhupathi, ranked 12th and 13th respectively, need to be in top-10 to make a direct entry into the men's doubles event of the London Olympics. The tenth draw in the 12-game match ensured that the Israeli stays in the match with honours even and now it will be a high-voltage drama in the rapid games to be played at the State Tretyakov Gallery on Wednesday. Anand, with his reputation of being one of the best rapid players ever, still holds an advantage but things have not exactly materialised the way he might have wanted in this match. Anand, who has inspired the younger generation in India to take to the game for the last 13 years as brand ambassador for IT company NIIT, started as an overwhelming favourite in the match. But the Indian Grandmaster could only force one victory in 12 games and lost one. This is indication enough that the first round has been won by the Israeli. In the rapid chess, Anand will have to score 2.5 points in the four games scheduled on Wednesday. There will be 25 minutes to each player in this contest with a 10-second addition after every move is played. If the scores are still tied after these four games, there will be two more games with blitz chess rules. Should the tie persist, there are five such blitz matches to be played.